Joy « CONSTABLE RESEARCH B.V. In 2002 the book Panarchy: Understanding Transformations in Human and Natural Systems, (Gunderson, L.H and Holling, C.S (eds)) was published. To my knowledge this is one of the most important books of our time. Panarchy is the first theory that is able to explain the behavior of complex ecosystems. It is an integration of many former theories in economics, biology, ecology, sociology, mathematics, psychology and other sciences. Have a look at RA to learn more about Panarchy. You will be surprised by the amount of interesting articles and insights. In this blog I will use long citations: “The world has not collapsed because natural ecological systems have the resilience to experience wide change and still maintain the integrity of their functions. The world also has not collapsed because of human behavior and creativity. People do learn, however spasmodically. Change and extreme transformations have been part of humanity’s evolutionary history. People’s adaptive capabilities, have made it possible not only to persist passively, but to create and innovate when limits are reached. The controls determined by each set of biotic structuring processes within terrestrial ecosystems are remarkably robust and the behaviors resulting are remarkably resilient. That robustness comes from functional diversity and spatial heterogeneity in the species and physical variables that mediate the key processes that structure and organize patterns in ecosystems and landscapes. The stability domains that define the type of system (e.g. forest, savanna, grassland, or shrub steppe) are so large that external disturbances have to be extreme and/or persistent before the system flips irreversibly into another state. Except under extreme climatic conditions, Mother Nature is not basically in a state of delicate balance. If She were, the world would indeed have collapsed long ago“. The books starts with a description of the five metaphors or world-views that are used to look at Nature. These metaphors are the same metaphors Bhaktin uses to describe the proces of the evolving narratives in human culture. The World-Views are connected to Mathematical Models that are commonly used in Science to explain an Ecology. The authors show that every model has its consequences. The most beautifull thing they show is that these models are not wrong. They are needed to keep the Cycle of the Ecology running. What they also show is that a Panarchy-cycle uses a memory when the Ecology is collapsing. Somewhere a small area is preserved. It contains the “seeds” of the new Cycle. We have to look back when we want to move foreward. We also have to look back to learn feom our mistakes. “People do learn, however spasmodically”. Learning is not copying. We have “to create and innovate when limits are reached”. Somewhere in History the Seeds of the New Cycle are available. A beautifull example is the Sacred Groove. It is a place where very old trees are preserved by the local community. They need the trees to aquire medicine to cure deseases or snake bites. Because the new Cycle has to be based on Harmony I feel you have to have a look at China. China is not only the Economy Power that is able to destroy the World when it moves on the way it moves. It is also the Culture where Harmony was the basic Concept. When you read my blogs you will see that I use many Chinese Concepts to explain. The theory is a Self-Referencial (“Fractal“) theory and uses the Moebius Ring as the central concept. You understand why I was flabbergasted when I found Panarchy on the Internet. The last thing that made me very enthousiastic is the name Panarchy. It is based on the name of the Old Greek God of Joy and Nature, Pan. 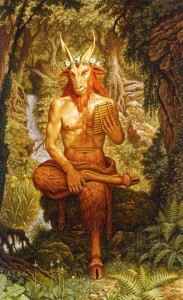 Pan was “Goat-legged, enthusiastic, a lover of ectacy, dancing among the stars, weaving the harmony of the Cosmos into playfull song” (The Orphic Hymns). The myth was told in Early Creece that he had left the Earth. It is of a high urgency that we ask Pan to come back. We can only save Mother Nature when we become enthusiastic again to weave Harmony all over the World. 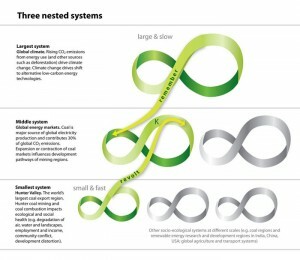 “Complex natural systems work in rhythms – with a front-loop phase of slow, incremental growth and accumulation, and a back-loop stage of rapid reorganisation leading to renewal, to, collapse. The front-loop phase is more predictable with higher degrees of certainty. In both the natural and social worlds, it maximises production and accumulation. The consequence of this is an accumulation and concentration of wealth, but also emergence of greater vulnerability, due to the increasing number of interconnections that link that wealth, and those that bear it, in efforts to sustain it. Little time and few resources are available for alternatives that explore different visions or opportunities. Emergence and novelty is inhibited. This growing connectedness leads to increasing rigidity in its goal to retain control, and the system becomes ever more tightly bound together. This reduces resilience and the capacity of the system to absorb change, thus increasing the threat of abrupt change. We can recognise the needs for change but become politically stifled in our capacity to act effectively. Wealth and broadening wealth accumulated to lead to our present vulnerability on a world stage. 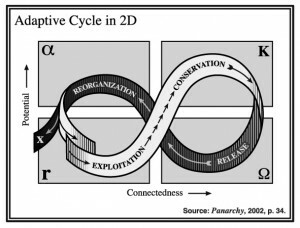 We are entering the back loop of re-organisation that entails the collapse of accumulated connections, the release of bound up knowledge and capital. But it also opens a creative potential and the opportunity for ‘creative destruction“. The World and Our Society is now in the non-predictable back-loop stage of rapid reorganisation, creative destruction, collaps and renewal. It will soon jump back to an early stage where the Seeds of the New Cycle of Creation are Stored. Because the Long Term Cycle of Earth is now Collapsing we have to look back for a long time to find the Seeds. The most impressive collaps of our World happened when the Great Flood appeared at 3117 BC. Strangely enough 3117 BC is the start of the Mayan Calendar and the Indian Kali Yuga (“The Dark Age“). Before that time the Humans lived in the Green Sahara also called Paradise. At that time Pan, the God of Nature, was still there. Do we have to move back to Paradise to Start All over Again?